If you’ve lived in Iowa, especially on a farm, anytime from the mid-1970s to today, there’s a good chance your family has tuned into Iowa Public Television (IPT) on Friday nights (or possibly Sunday afternoons) to watch Market to Market. That’s how it has been at my family’s Century Farm, and it’s a tradition that makes me proud to be an Iowan. After all, Iowa is the home of Market to Market, which has covered issues affecting agriculture, from global trade conflicts to environmental controversies to changing technology, for more than four decades. Today, the weekly news segments and market commentary are geared towards the nearly 60 million people who live and work in rural America. Even when I was too young to really know what Market to Market was all about, I could always identify the show by its music. I didn’t know the ending theme song was “Buy for Me the Rain” by the Nitty Gritty Dirt Band. I just called it the Market to Market song, and I’m glad it’s still part of the show. History and tradition are part of Market to Market, the longest-running TV show of its kind. 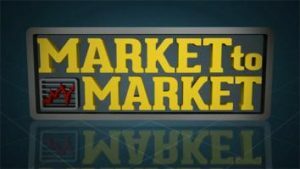 The first episode of Market to Market debuted on October 24, 1975, on IPT. Back then, the show was called “Farm Digest,” I learned from Dave Miller, a senior producer/director who has worked at IPT more than 33 years. 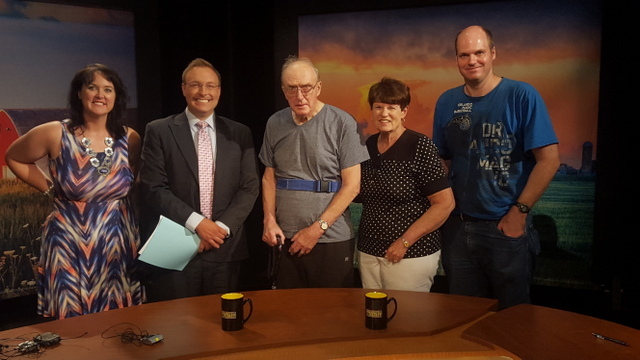 I met Miller in July when my family and I toured the IPT studio in Johnston. The tour came about after Josh Buettner, an IPT producer/director, visited our farm a few years ago to shoot a segment on water quality. He mentioned that if I’d ever like to watch a taping of Market to Market, he could arrange it. I thought it would be cool to take him up on this unique opportunity, since my family has been Market to Market fans for decades. When we pulled up outside the gleaming white studio on a hot Friday afternoon in July, we felt like royalty as IPT staff members greeted us at the front door and welcomed us into the bright lobby. When we were ushered back to the control room around 4 p.m., I was amazed by how dark the rest of the building is. At the word “go,” vibrant images flashed onto row after row of computer monitors that glowed against the black surroundings. “Thunder!” called out one producer as the famous Market to Market logo shot onto the screens. About 10 minutes later, we were ushered across the hall into the cavernous main studio, where Market to Market host Mike Pearson sat at a spacious desk and prepared to interview analyst Tomm Pfitzenmaier. As the red digital numbers counted down on a monitor near us, it seemed surreal to watch the interview in progress, both in person just a few feet from us and on a TV monitor right in front of us. As I took it all in, from the thick power cords snaking across the floor to the huge cameras to lights of all types hanging from the black ceilings, I wondered what the technology was like back when Chet Randolph hosted the show. Dave Miller filled in some of the gaps. “I can remember when we had to run the tapes to the bus station in Des Moines so they could be put on an express bus to Lincoln, Nebraska, which had the nearest uplink,” he noted. Wow, times have definitely changed. Still, one thing hasn’t changed—the Market to Market team’s commitment to share timely news and ag-related feature stories each week. When the show wrapped up and I heard the familiar notes of “Buy for Me the Rain,” it was amazing to think that the segments recorded right in front of our eyes would be broadcast to 20 states from California to Tennessee in just a few hours—and it all starts right here in Iowa. This piece originally appeared on Farm News.